Sophie was born in September of 1999 and grew up in Central Florida, where she still resides. In her first live performance, she performed the American National Anthem and Canadian National Anthem for the Tampa Bay Lightning, at age 8, in front of 19,000 people. She never looked back! At age 9, she had the privilege to open for a Blood, Sweat & Tears concert and sing for several professional sports teams in Florida. Sophie started learning the piano 10 years ago and is still taking lessons. Hold Me Close is the first original song she composed with the piano. At 12, she picked up her first guitar and started strumming. She fell in love with the guitar and most of her original songs are written with her guitar. During her live performances, she mainly accompanies herself with her guitar, with a few piano/keyboard songs sprinkled throughout the show. While Sophie performs several genres of music, from Etta James to Cheap Tricks, she remains loyal to her true love: Country Music. Sophie adds a little country flair to most songs she performs. Sophie’s style of play and songwriting has been influenced by today’s female country stars, including Miranda Lambert and Carrie Underwood, as well as some of Country Music’s legends: Loretta Lynn, Patsy Cline and Johnny Cash. Sophie has been honored to perform at large venues including the Amalie Arena and Tropicana Field in Tampa, the Amway Center and the House of Blues in Orlando. Sophie can be found performing in Central Florida several times a month at a variety of local venues. Accompanying herself with her guitar and keyboard, she performs 2-hour to 4-hour shows. 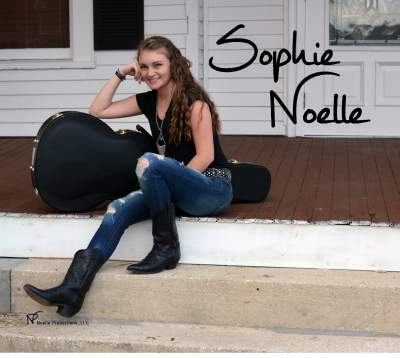 Sophie just released her first EP, “Sophie Noelle” and is working hard at writing new songs for her second EP.